Quaint retro beach house just a stone’s throw (350m) from the charming Rosebud swimming beach. This fully accessible, pet friendly, spacious cottage is located in a quiet street surrounded by holiday houses, just 5 minutes’ drive to Rosebud shops, cinema, weekend markets. Amazingly spacious, securely fenced backyard, delightful terrace shaded by huge liquidamber tree with outdoor furniture and BBQ. Located within 10-15 minutes of several championship golf courses, and the celebrated Peninsula Hot Springs, this retreat is perfect for golfers, families or small groups. Inside, this deceptively ordinary cottage is a fully renovated surprise! This 3-bedroom house sleeps up to 7 guests and boasts a fully equipped kitchen, separate lounge and dining area, an open gas fired fireplace, flat screen TV, laundry facilities and spa bath. French doors lead from the dining room to the spacious outdoor terrace and al fresco dining area. Linen and bath towels are included in the price. Generous sized rooms with windows that open to let the sea breezes in! This property is wheelchair friendly with a ramp into the house, larger door frames, rails, shower seat – indeed, an independent living centre specifications bathroom. Two bedrooms have king size beds (one can split into 2 singles). The other bedroom has 2 single beds. There is also a sofa bed, cot, and high chair. For couples, families, golfers, pet lovers or people travelling with family members requiring accessible facilities, our accommodation is available as 1, 2 or 3 bedrooms, (2-7 people). Available for a 1 night stay, weekends or longer holiday accommodation. People can choose to book one, two or three bedrooms and still enjoy sole use of the house facilities. However, those bedrooms/ensuite facilities which are not booked will be unavailable for use. - Perfect for visitors with limited mobilty and in wheelchairs. The beach house has: ramped pathways, disabled toilet, wide doorways, grab rails in bathroom. The toilet seat is lower with adequate circle for turning a wheelchair. No lip shower with adjustable shower on vertical rail. - Fully self-contained for 6 adults & one children. High chair/porta cot available. - Huge securely fenced backyard - perfect for pets and children! - Delightful outdoor dining terrace - fully shaded by a fabulous liquid amber tree and adjacent to a loquat tree. - Modern, well equipped kitchen and dining area with French doors leading to a spacious terrace and outdoor dining /BBQ area. - Cosy lounge room with a fold out sofa bed, flatscreen TV/DVD/radio/cassette player. Just a 5-minute walk from Rosebud Beach, Nazaaray Beach House offers a spacious sun deck complete with outdoor furniture and BBQ facilities. The 3-bedroom house features an open coal fireplace and a spa bath. 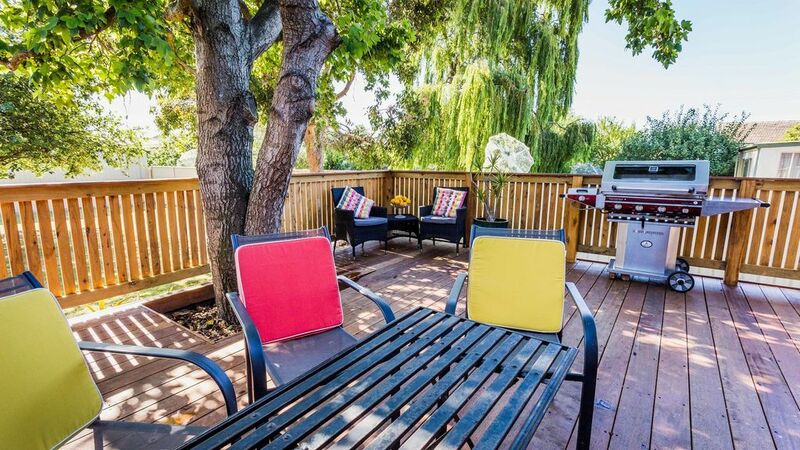 It is within a 20-minute drive of Peninsula Hot Springs, Cape Schanck Lighthouse and multiple international rated all weather golf courses h It has a spacious dog-friendly backyard .This property is wheelchair friendly with a ramp into the house, rails, shower seat and larger door frames. Very accommodating and helpful owners. We had a nice stay. House was ok, it was lacking a pantry in the kitchen and there wasn't enough mugs for the amount of people it's suppose to cater for. Overall the house could have been cleaner, and a little more inviting. Great location, close to beach and shops.